In 2013, Big Sur, California’s The Henry Miller Memorial Library moved East for a week’s worth of art, music, and literature called the Big Sur Brooklyn Bridge. From May 12-19th, this Big Sur Brooklyn Bridge celebrated the Henry Miller Memorial Library while paying homage to the borough’s rich literary heritage. Friends included Philip Glass’ Days & Nights Festival , folkYEAH Presents, Grove Press, New Directions, the Allen Ginsberg Trust, Pomegranate Arts, The Big Sur Bakery, and more! Check out the week that was below…And hopefully we’ll see you next time! Mon. May 13- Sun May 19 – “Home Base” pop-up bookstore at City Reliquary, 370 Metropolitan Ave., Brooklyn, NY. Every Day Noon – 6PM. Mon. May 13 – Opening Night Party / Ping Pong Poetry Reading at City Reliquary w/ special guests Philip DeGruy and Tom Youd. Tues. May 14 – Big Sur Brooklyn Bridge Staff Party at City Reliquary with Philip DeGruy, Tim Youd, Al Rose & Steve Doyle…plus stories from Cowbird. Wed. May 15 – Always Merry & Bright: Celebrating the Inspiration of Henry Miller with music by Peter Stampfel (Holy Modal Rounders), Bushwick Gospel Singers, and Al Rose at Spike Hill. Thurs. May 16 – Miller: Libertine, Communard: An evening of talks at Spoonbill Books. Fri. May 17th – An Evening of Short Film with the Big Sur International Short Film Screening Series and the Brooklyn Short Film Festival at Videology. Sat. May 18– Upright Citizens Brigade present “Tropic of Laughter” at Knitting Factory. Sun May 19 – Philip Glass & Friends at Williamsburg Music Hall in a benefit for the Henry Miller Memorial Library. Big Sur, California’s The Henry Miller Memorial Library moves East for a week’s worth of art, music, and literature with friends Philip Glass’ Days & Nights Festival , folkYEAH Presents, Grove Press, New Directions, the Allen Ginsberg Trust, Pomegranate Arts, The Big Sur Bakery, and more! The Henry Miller Memorial Library is a non-profit 501 (c) 3 art center in Big Sur, CA dedicated to promoting the artistic legacy of its namesake. It’s where Philip Glass performs “Dracula” under a canopy of redwoods. It’s home to one of the most comprehensive Miller archives in the world. It’s where Arcade Fire held their sound-check inside a tiny cabin, surrounding a piano. And now the Library is bringing its omnivorous operations eastward for a week’s-worth of art, comedy, music, and movies to Miller’s old neighborhood of Williamsburg, anchored by a pop-up bookstore at the City Reliquary that will include rare original manuscripts, letters, books, and more. 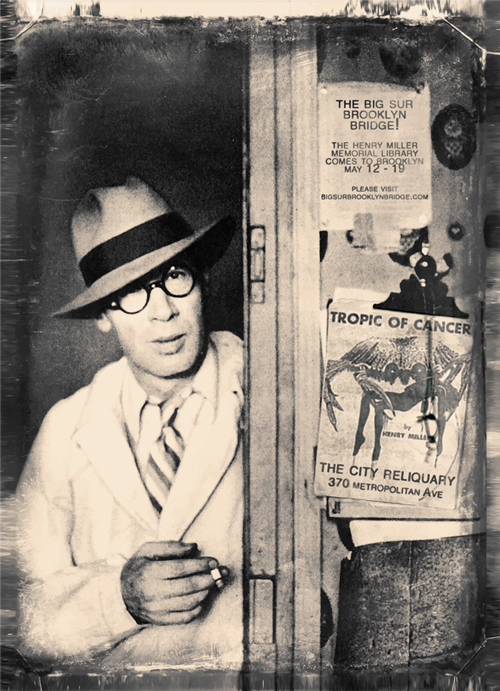 From May 12-19th, this Big Sur Brooklyn Bridge will celebrate the Henry Miller Memorial Library while paying homage to the borough’s rich literary heritage. Check out the events page and see what’s in store!